Point Grenville on the Quinault Indian reservation shelters two spectacular beaches and a collection of offshore seastack rocks that rival anything on the Oregon coast or north up in the Olympic National Park. The Quinault tribe keeps this treasure to themselves, doing little to promote tourism. However, you may visit by purchasing a beach pass. The beach entrance lies just seven miles north of Pacific Beach, WA. The interesting thing about this landscape is the way it unfolds over a 2 1/2 mile walk from the beach entrance out to the point. (Note: You may also drive on this beach to shorten up the walk, keeping to the high part of the beach to avoid the clam beds.) At the entrance, you step out onto a wide, sandy beach with forested cliffs behind that are typical of the area. In the distance you can see a large promontory, marking the point, and two, large seastack rocks to its left. But these are as yet indistinct. A little further along the beach you will reach two isolated, 50-foot high rocks high up on the beach crowned with trees and vegetation. One of these slopes down on the north side for an easy climb. At the top you can enjoy a bit better view south towards Moclips and Pacific Beach, out to the ocean, and north to the point. Someone has installed a rope to climb the steeper, second rock. Continuing north, you begin to approach the point and the seastack rocks more closely and their details become visible. The two largest seastacks are topped with green vegetation. A flock of seagulls wheels around and settles on these rocks. Smaller rocks at their base kick up the sea spray as the waves crash into them. Then a surprise emerges: far out to sea beyond the point and hidden by these two large seastacks is a large rock with an arch in the middle of it. As you reach the point, you pass some smaller rock formations, piles of driftwood (missing further south), and some rocks covered in barnacles and mussels. The shore forms a tight, half-circular bay here and the waves swirl around in interesting patterns. Ahead of you is the point, a large volanic hill perhaps 200 feet high. This tapers down to a barrier about six feet high, and then the land rises again to meet the 100 foot high cliffs. The obvious thing to do is see what is over that short barrier. The anticipation builds as you approach it. It's an easy climb over the barrier, and then you hop down into one of the most stunning sights of the whole Washington coast. You are standing in a narrow, semi-circular bay. An amphitheater, you might call it. On the other side of the barrier you were walking on sandy beach. Here you stand on volcanic gravel. Towering, 200-foot rocks mark the north and south boundary of the little bay. The rock to the north has an arch in it. Out to sea you get a closer view of the offshore rock with an arch mentioned earlier. All around you in this bay are small, offshore rocks between a few feet and 20-30 feet high. The water churns and boils in fantastic ways among these dozens of rocks and the volcanic cliffs echo the sound. I was here near sunset, which lit all the rocks up beautifully. I climbed a slippery, 20 foot rock to get the best view around the two points. I was trembling from the unsure footing, the vibrant crashing sounds all around me, and the sheer beauty of the scene. On the long walk back to the car, I kept looking back at the sunset, which was prettier every time. I took a sequence of six or seven sunset pictures. I can't recommend this visit highly enough. It's not to be missed. 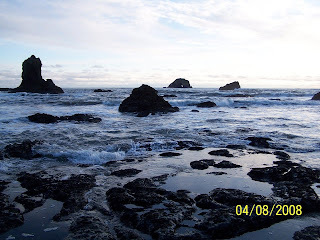 You must buy a beach pass to visit the beaches of the Quinault Indian Nation. A day pass costs $5 per person or $15 per family. Weekend, weekly, and monthly passes are available too. I bought my pass at the tribal administration complex - building B - in Taholah, WA. Taholah lies at the end of highway 109. Look for the administrative buildings on your right - a collection of modern-looking buildings - after passing the church on your left at the town entrance. Passes are available on weekends at the police department. Ask for the map - a multiple page brochure on the area beaches. Taholah itself has a marvellous beach, which I might have featured if I hadn't visited Point Grenville later in the day. You can park right by the river and beach entrance just beyond the mercantile (groceries and cafe). It reminded me a bit of Ruby Beach north of Kalaloch. This is a rocky beach varying from large flat stones down to pea gravel. The Quinault River flows into the ocean on this beach. Across the river to the north you see two large rocks forming Cape Elizabeth. To the south you'll see massive piles of driftwood. These would have been spruce trees that floated down the river. Spruce trees grow up to 300 feet tall in this area. In the distance to the south you can see the north end of Point Grenville. I would have walked on several miles towards the point, but I had my little boy with me. Your beach pass permits you to venture north of Taholah to Elephant Rock - a fantastic formation of multiple arches on the beach. However, this beach is reached by an eight mile dirt road and a two mile rough trail with bear and bobcats active in the area. The brochure says that the animals will "probably" run away from you. An Indian guide is available to accompany you to this area.